Each month the Regional Foundation Center's Inforum newsletter features a local funder, nonprofit, or service provider who highlights their organization's services and how they support the social sector. This month we are excited to have Doug Barg, founder and president of Kitchen Cred to talk about the organization's work with teens and how the RFC has helped his organization. ...at-risk teens. Of course, with the onslaught of fast food ads, bullying, food deserts, opioid addiction, performance pressure, and stress about body image, who in middle-school or high-school is not at-risk? To date, we have worked with teens living across the Delaware Valley from Exton to Camden. How do you change the lives of the people you serve? Seven pairs of eyes focus on the thin disk of batter in the pan, as the teen cook steadies himself for his first attempt. With a determined look and a quick, almost assured, flick of the wrist, he launches the crepe spinning into the air. His team draws in a breath in anticipation – and he sticks the landing, golden brown side up, back in the pan. His teammates—a chef, adults, and other teens—spontaneously burst into applause. Middle school and high school is a period of challenge and change, to put it mildly. Kitchen Cred provides skills, perspectives, and success to support the journey from child to adult. 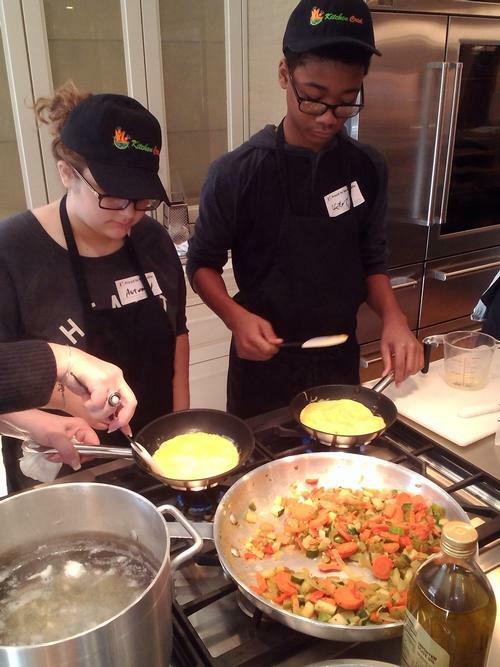 Under the guidance of culinary pros, teens acquire the fundamentals of cooking, nutrition, food safety, and food economics. Simultaneously, they develop a range of competencies including leadership, project planning, and career options, all the while building self-esteem. 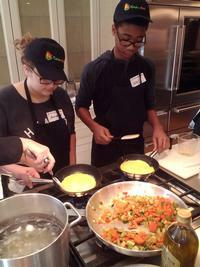 The shared experience of cooking paves the way for open, genuine conversations between teens and adults. Currently, Kitchen Cred’s menu of programs comes in two formats: a six-session Short Program and single-session, themed Pop-Ups. Pop-Up themes include holidays, career exposure, and college admissions. Our newest career exposure program, Career Bowls, was created in collaboration with the local chapter of the NFL Alumni Association. It introduces teens to sports-related careers ranging from sports broadcasting to custom tailoring suits for pro-footballer frames. Kitchen Cred connects with youth through partners such as Big Brothers Big Sisters, YouthBuild Philly Charter School, Youth Service, Inc., Triskeles, and LUCY Outreach. Incorporated in January of 2013 as a 501(c)(3) nonprofit, Kitchen Cred’s program has won recognition in the Independence Blue Cross Game Changers Challenge and the Philadelphia Social Innovation Journal’s 2017 Social Innovator Award for Education. How has the RFC helped your organization? It’s hard to name all the ways in which the RFC has aided Kitchen Cred. To the extent that we know how to craft a grant proposal, it is thanks to the RFC workshop series. The Regional Foundation Center makes the Free Library a focal point, a nexus, a mixing bowl for Philly’s nonprofit community in a way that no other entity comes close to. From Benevon to the PHILO Project (see below), I can’t name all the mutually beneficial and strategically important relationships that germinated at one of the myriad panel discussions, meet-ups, and classes organized or hosted by the RFC. In addition to my role at Kitchen Cred, I also chair the Nonprofit Subgroup of Beacon, a networking group of about a thousand experienced, committed C-level professionals. The members of our subgroup are nonprofit leaders or sit on nonprofit boards across the region. My belief that the RFC is a unique (and vastly under-recognized) resource, led me to arrange a breakfast meeting and orientation session for our members with RFC staff at the library. It’s safe to say the Beacon folks came away from the session chagrined that they had not known about this gem of a resource hidden on the Parkway and elated that they could share their new find with their boards and staff. What tools and resources have been most helpful in growing and sustaining your organization? The RFC forges a wide range of tools and experiences that have helped Kitchen Cred grow and thrive. Consequently, it’s hard to pick a "most helpful" tool. Learning about Network for Good and Benevon have shaped our fundraising. Our communications strategies and tactics are rooted in the Center’s workshops and panel discussions on social media and nonprofit marketing. But perhaps most importantly, Kitchen Cred derives its dynamic energy from collaboration. Each nonprofit event at the RFC opens doors to new relationships and triggers new program ideas. The number and quality of RFC events constantly stoke the creative fire for us. Can you speak about a time you successfully collaborated with another organization? When people visit our website, or we make a presentation to a new agency partner, prospective board member, or possible sponsor, one of the first things they see is a masterful video created by the PHILO Project. The quality of the piece conveys an image of professionalism and competence that drives volunteer engagement and paves the way for serious conversations. It’s been a real game changer for us. The PHILO Project is itself a nonprofit that creates professionally produced, highly impactful videos for other nonprofits at no cost. We first learned of PHILO and met founder Gerald Kolpan at an RFC showcase event. What is something awesome that people may not know about your organization? Our Chef’s Table, the group of culinary pros who help us and lead our programs, includes chefs who have appeared on Iron Chef, Top Chef, Chopped, Hell’s Kitchen, and Bar Rescue. Thanks Doug for sharing the great work your organization does to help at-risk teens. For nonprofit organizations interested in learning how the RFC can help their organization check out our resources or make an appointment with a librarian! Exciting work, Doug. Bravo! Happy to read about how your many talents are making a big difference in the world. This is a great idea, I have a non-profit, Haitian-American United For Change, INC. We need to connect ASAP. What an inspiring program! Thanks for working with our teens. It is great you are spreading to word to colleagues about the Regional Foundation Center so they can benefit from this hidden gem on the Parkway. Doug, Way to Go! Great organization!